TM-0808-CW JL Industries Non-Rated Access Panel - 8" x 8"
The JL Industries TM-0808-CW is a Non-Rated 8” x 8” Access Panel. Add 3/8” to width & height..
TM-1212-CW JL Industries Non-Rated Access Panel - 12" x 12"
The JL Industries TM-1212-CW is a Non-Rated 12” x 12” Access Panel. Add 3/8” to width & heig..
TM-1414-CW JL Industries Non-Rated Access Panel - 14" x 14"
The JL Industries TM-1414-CW is a Non-Rated 14” x 14” Access Panel. Add 3/8” to width & heig..
TM-1616-CW JL Industries Non-Rated Access Panel - 16" x 16"
The JL Industries TM-1616-CW is a Non-Rated 16” x 16” Access Panel. Add 3/8” to width & heig..
TM-1818-CW JL Industries Non-Rated Access Panel - 18" x 18"
The JL Industries TM-1818-CW is a Non-Rated 18” x 18” Access Panel. Add 3/8” to width & heig..
TM-2222-CW JL Industries Non-Rated Access Panel - 22" x 22"
The JL Industries TM-2222-CW is a Non-Rated 22” x 22” Access Panel. Add 3/8” to width & heig..
TM-2424-CW JL Industries Non-Rated Access Panel - 24" x 24"
The JL Industries TM-2424-CW is a Non-Rated 24” x 24” Access Panel. Add 3/8” to width & heig..
TM-2436-CW JL Industries Non-Rated Access Panel - 24" x 36"
The JL Industries TM-2436-CW is a Non-Rated 24” x 36” Access Panel. Add 3/8” to width & heig..
FD-1212-UW JL Industries Fire-Rated Access Panel - 12" x 12"
The JL Industries FD-1212-UW is a Fire-Rated 12” x 12” Access Panel. 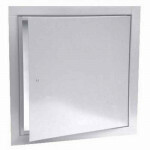 Add 3/8” to width & hei..
FD-2424-UW JL Industries Fire-Rated Access Panel - 24" x 24"
The JL Industries FD-2424-UW is a Fire-Rated 24” x 24” Access Panel. Add 3/8” to width & hei..
FD-2436-UW JL Industries Fire-Rated Access Panel - 24" x 36"
The JL Industries FD-2436-UW is a Fire-Rated 24” x 36” Access Panel. Add 3/8” to width & hei..